Director: Malcolm D. Lee. 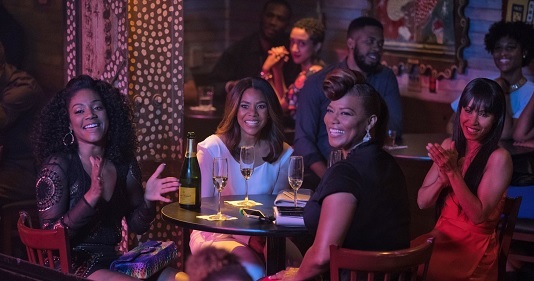 Cast: Regina Hall, Queen Latifah, Tiffany Haddish, Jada Pinkett Smith, Mike Colter, Larenz Tate, Kate Walsh, Deborah Ayorinde, Kofi Siriboe, Lara Grice, Donna Biscoe, Tonea Stewart, Robert Miano, Mike Epps, William Levy, New Edition! Diddy! Common! Iyanla! Ava! Terry! Ne-Yo! Melissa! Mariah, baby! Yes!! Screenplay: Kenya Barris and Tracy Oliver (based on a screen story by Erica Rivinoja, Kenya Barris, and Tracy Oliver). Twitter Capsule: They sure do, hilariously. They also pull it back in and pull each other through. Not a craft showcase but a great time. VOR: ③ Exuberant fulfillment of a persistent gap in the market for comedies led by black women. Malcolm D. Lee has a good portfolio going.